At this point, there are 2 outstanding issues I’m aware of with the new game engine. 1. After extended primaries, the electorate tends to become polarized, such that it is very difficult to get significant % movement once you get to the general. 2. After intense primary battles (such as in IA or NH), party %s can get skewed from what seems like realistic %s. For example, 70%R-30%D in NH. Overall, though, I’m very happy with the game dynamics with the new Favorability game engine. An official version will probably be released next week, and then it will be on to making an official 2020. Thanks for the update Anthony, excited for the new feature release. (1) Throwing this out there, do you have an attribute for each voter in the polling system that has propensity to vote in primaries and/or party loyalty? Or are the turnouts fixed? Or does it come down to favorability? There are a lot of voters (in some states pluralities or even majorities) that won’t vote in primaries. I wonder how those individuals are treated, maybe that’s part of the solution. (2) From what you’re saying, the issue seems to occur if the parties are staggered at different times in terms of when the primaries end. Some of the stuff from (1) (party loyalty and/or general election only voters) might apply here too. Alternatively, maybe there needs to be a way within the party to model a bandwagon effect. 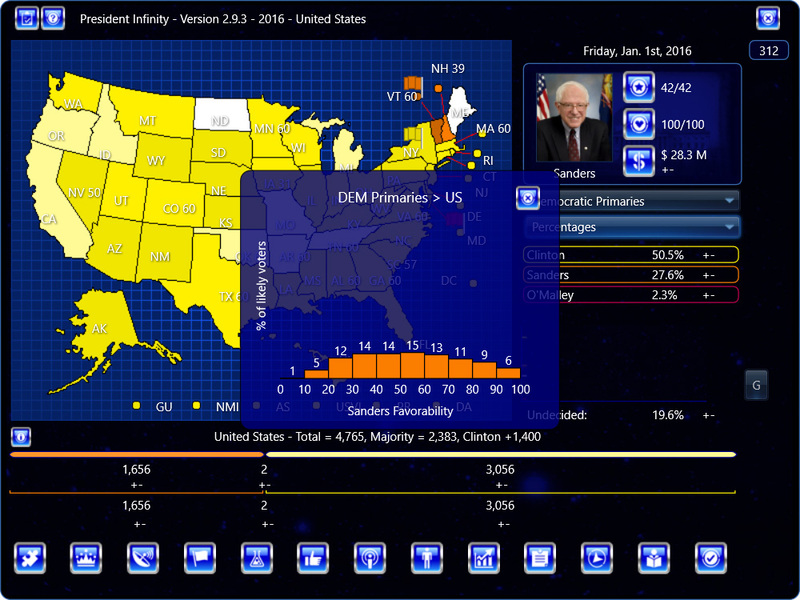 After the nominee is decided, most remaining primary voters go for the frontrunner, and turnout overall drops. (1) Maybe the threshold for primary voters should be higher? Or rather, the general election should be lower. That is to say, instead of candidates say having favorability > 30% (or whichever it was) to vote in both, maybe 30% for the general, and 50% in the primaries? (2) Maybe having separate favorabilities for the Democratic and Republican parties (in addition for candidates) would help? This kinda ties into what I said above about party loyalty. So voters will participate in primaries if they have a high favorability for a candidate *or* a high favorability for the party in question (so both conditions would need to be met). We actually talked about this on the board I think. When talking about how in a two-way race as opposed to a wide open field, you have people who back the frontrunner (just because) and people who back the opposition (just because). This might be a dynamic you already have in mind. It also might not be the best way to go about it (since as you've said, the best thing to do is trying to find a simple solution, and maybe there's a better way to go about it than joint favorabilities and adding more conditionals). Anyhow sorry for the rant. Thank you as always Anthony. “4 D fav > 50% & Sanders fav > Clinton fav, < 50%: Sanders potential primary voter (opposition support, could wait until Nov.)"
The last version I worked with is 2.9.6. I experienced errors where I was unable to load save games. I was also in the middle of a game where I could only do activities for the current day of the week even though I was in 7-day turns. Also I could no longer get the percentages, popular vote, etc. for any particular state by clicking on it. When I tried to re-load an earlier game save, the program hung and then when I re-started, I got a message that it was unable to read the game file. Please try 2.9.8 and let me know if you continue to experience any bugs. 1. Trying to model primary turnout is very difficult. The game uses the number provided by the campaign designer. If it isn’t provided, it uses a number that would be equivalent to general turnout. Either way, the %s are determined by the eligible voters, and some don’t vote (those who are alienated, that is, have <25 for every candidate). 2. I think adding something like party affiliation, beyond candidate affiliation, is the right way to go. This is because it seems accurate - people tend to affiliate with a party, and then are unlikely to leave the party unless the candidate is really bad or out of whack with those people's platforms. You could perhaps say that comes down to just platform, and that's certainly at least partially right, but I think when people become committed to a party they also tend to tune into certain media sources, which reinforce that commitment. It requires something to really push them out of that 'orbit'. 1. Re threshold higher for primaries, that's a good idea. I'll think about it. Got a weird but unimportant bug. On my 2020 scenario, Bill Kristol endorsed Trump immediately. I had him set ready to endorse anyone but Trump and he only allowed the positions C and CR, and Trump was R. The next day, he took back the endorsement. If you link to your campaign, I can attempt to recreate the bug. In 2016, with dissent among both Republicans AND Democrats over their party’s final nominee, I saw a lot of folks I know either going third party or writing in a name instead. Yes, at least in extreme cases, there should be the possibility of large numbers of defections to a 3rd party candidate. I should add that defections in general were a small % of the total vote in 2016. Trump + Clinton received 46.1% + 48.2% = 94.3% of the vote. Compare to 2012 where it was 47.2% + 51.1% = 98.3%. So a large relative increase in voting for candidates outside the main 2, but still a small absolute % increase (1.7% -> 5.7%, so relative increase of 335% but absolute increase of 4%). It’s planned for the Winter 2018-19 cycle, see here https://270soft.com/2018/12/12/goals-for-next-releases-winter-2018-2019-preview/ . My best guess is March. Please contact me by e-mail so I can help figure out what is causing this. https://270soft.com/contact . What influences whether a candidate declares, if you set them to “undecided” at the start? I assumed it was “ambition”, but I’ve poked at it a bit and don’t seem to be making a difference. In VCCzar’s 2020 campaign, I’ve tried playing with all the declared candidates on, and the major names in the wings (such as Biden, Sanders, etc) as “undeclared”. But within the first week, they all announce they’re not running, 100% of the time. This happens regardless of whether I start in January 2020 or June/July/August 2020. Would like to see more randomness to the decision making, or at least some small percentage chance of a yes, but don’t know how to edit the files to do that. @anthony_270admin It SEEMS to be okay now in 2.9.9, I’ll re-create it if I can and let you know. Thanks for being so responsive on this! The Undeclared -> Decided mechanism is fickle. When the official 2020 is released, I’ll look at this – thanks for this.